Say NO! 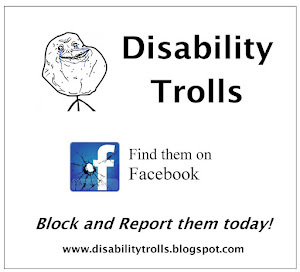 to Facebook Predators: Disability Trolls: What is a Disability Troll? 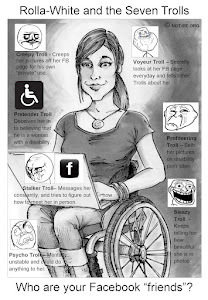 What is a Disability Troll? 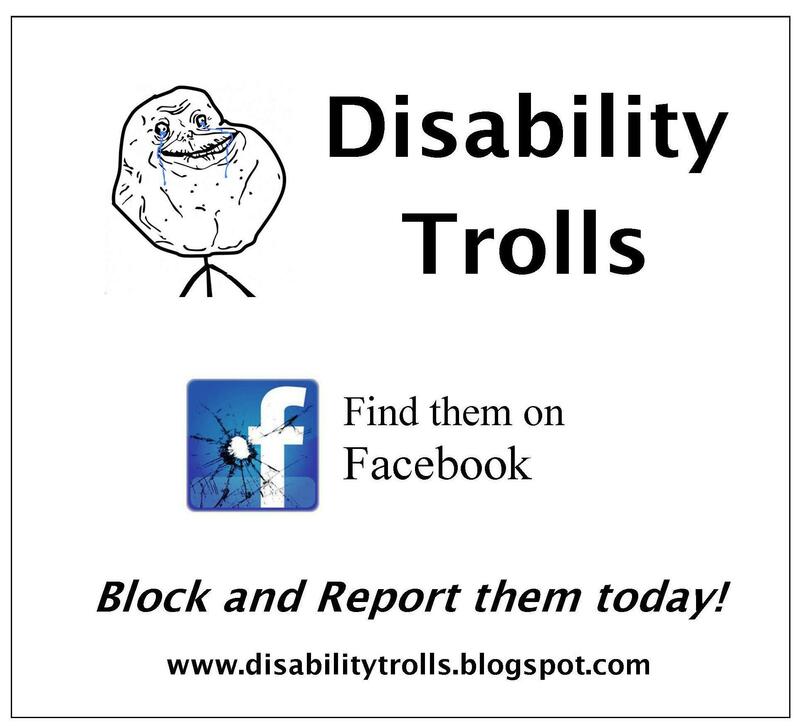 Wheelchair Pretenders – People who pretend to have a disability. 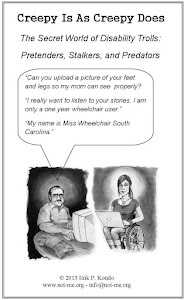 The most common Pretender is someone who deceives people into thinking they are a wheelchair user. Pretending to be an amputee is also common. Coercive Devotees – Devotees are people that are attracted to people with disabilities specifically because of the existence of the disability. 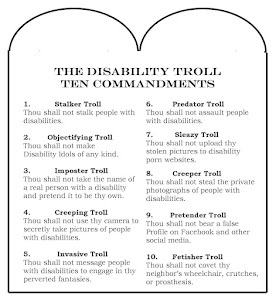 Coercive Devotees engage in disrespectful and anti-social behavior such as stealing personal photographs of people with disabilities, uploading those photographs to websites, stalking people with disabilities, deceiving people with disabilities, and engaging in other unwanted behavior. 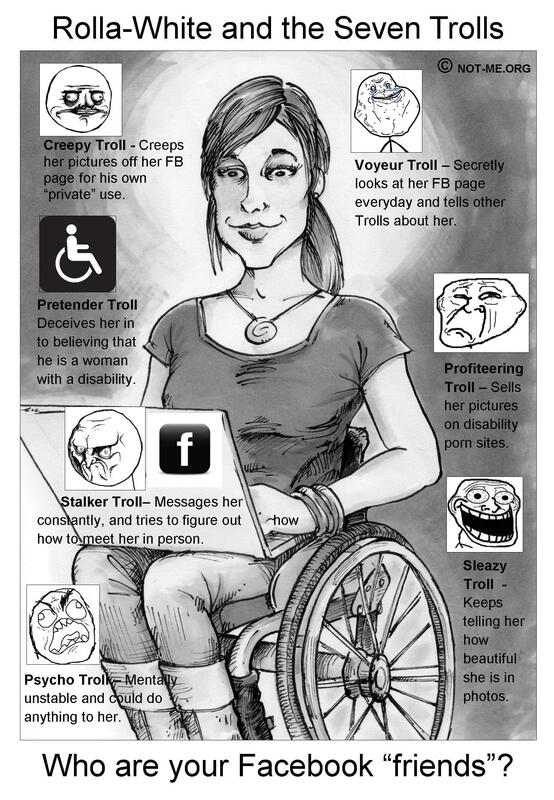 Disability Fetish – People who have an unusual sexual attraction to actual or pretend disability. 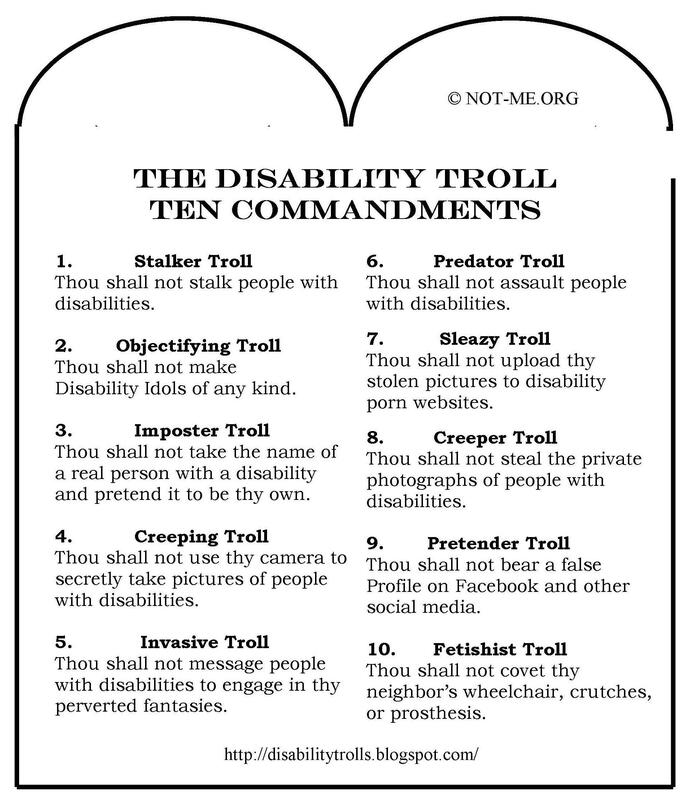 Disability Stalkers – People who actively seek out and stalk people with disabilities. The following information was provided to me from a Devotee who is very knowledgable on this subject. "Devotees and Pretenders, What's the Difference? In this piece I am trying to give you simple definitions, with simple words so everybody can understand, though I have written about the subject at length on my blog. Devotees – Devotees are people who are attracted in some way by disability. This can be one disability, or many disabilities. 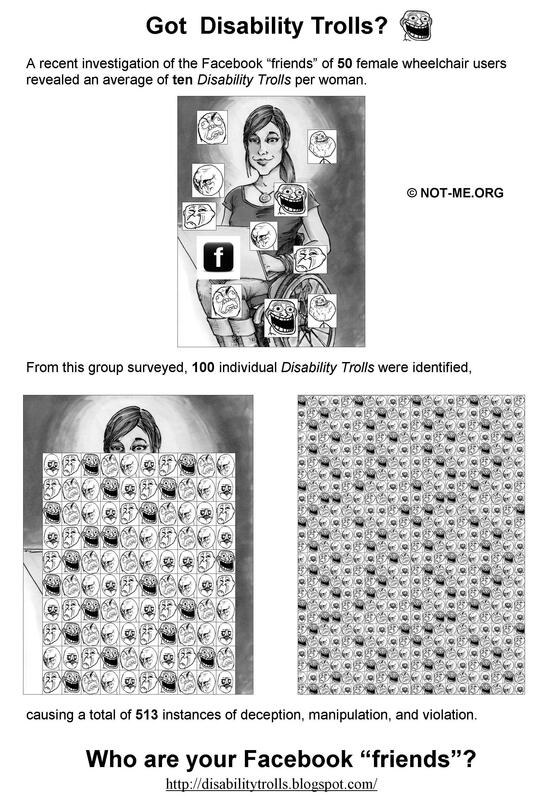 Some people are attracted only to the disability, and some are not. Some devotees are more attracted by the equipment that people with disabilities use than by the disability. For some they just like seeing people use crutches or a wheelchair even if they don't really need it. Pretenders – Some people pretend they have a disability to get out of going to work, or to avoid the army. These people aren't pretenders. Pretenders are people who pretend they have a disability only because they enjoy it. Sometimes though a devotee online will pretend to be disabled to trick other disabled people into sharing their photos or videos with them. These are not pretenders, these are coercive devotees. Not all devotees are coercive. Some will be honest with you about their feelings, and some will just leave you alone. Some devotees don't care though, and will try to trick you or film and photograph you when you aren't looking. I had a friend who was a pretender and she was stalked by one of these devotees, and I know of one other pretender who had it happen too. Be careful who you add as a friend online, and what you allow the public to see."